The familiar zebra finch (Taeniopygia guttata) and parakeet (Melopsittacus undulatus), both natives of Australia, live as pets in homes around the world. Other finches and parakeets include wild finches, family Fringillidae, and parakeets, subfamily Psittacinae. While the only native parakeet, the Carolina parakeet (Conuropsis carolinesis), is extinct, feral parakeet populations live across the United States. All of the finches and parakeets have similar dietary needs -- their seed mixes are interchangeable. Wild finches and feral parakeets can use the seed mix in your bird feeders to supplement their diets, but pet birds depend on you to provide more than a seed mix to thrive. Finch and parakeet seed mixtures incorporate a variety of seeds, including millet, thistle seed and flax seed. Some mixes also include larger seeds such as sunflower seeds, but the birds generally prefer the smaller seeds like millet. Special treats for the birds include millet sprays and sprouted millet seeds. Add fresh fruits and vegetables such as diced carrots, carrot tops, dandelions, fresh grass seeds, sliced apples, sliced pears, spinach and strawberries to pet birds' diets. Avoid harvesting fresh foods that may have been sprayed with herbicides or insecticides, and wash all items thoroughly before giving them to the birds. 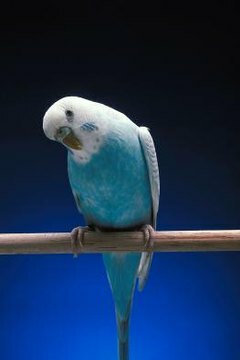 A pet finch or parakeet's diet should include 70 percent seeds or pellets and 30 percent fresh foods.